St. Martin's Paperbacks, 9780312943738, 368pp. Jason Palmer loved being a soldier. But after returning from Iraq with an “other than honorable” discharge, he’s finding that rebuilding his life is his toughest battle yet. Elena Cruz is the first woman to make Chicago’s prestigious Gang Intelligence Unit. A fearless cop, she’s ready for any challenge…until Jason Palmer’s brother, a prominent community activist on the South Side, is murdered—in front of his son. Now Jason and Elena are caught in a conspiracy stretching from the darkest alleys of the ghetto to the manicured lawns of the city’s power brokers. In a world where corruption and violence are simply the cost of doing business, the two of them are all that stand between an innocent child—and the killers that hunt him. 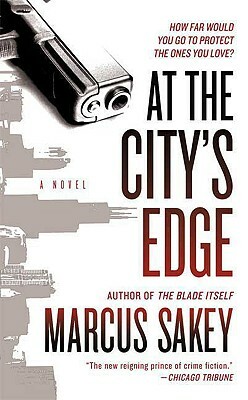 MARCUS SAKEY is the author of "The Blade Itself" (available from St. Martin's Paperbacks). He has shadowed homicide detectives, toured the morgue, interviewed soldiers, ridden with gang cops, and learned to pick a dead bolt in sixty seconds. Born in Flint, Michigan, he now lives in Chicago with his wife.